Contact listing agents Scot Munro 605-641-6482 or Heath Gran 605-209-2052 of Great Peaks Realty. 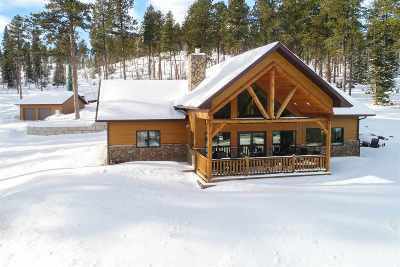 Spacious home located near the Lead Country Club, outdoor recreation, Terry Peak & local snowmobiling. The garage space is abundant in the attached 3 car with upper bonus room, and the 2 stall detached. The home, with 2734 sf, includes a spacious layout and log-style accents. Inside, you will enjoy the vaulted ceiling that soars over the living room where you can relax near the woodburning fireplace or step out thru the sliding patio doors to the covered deck. The kitchen has abundant storage, a center island, and comes equipped with appliances.